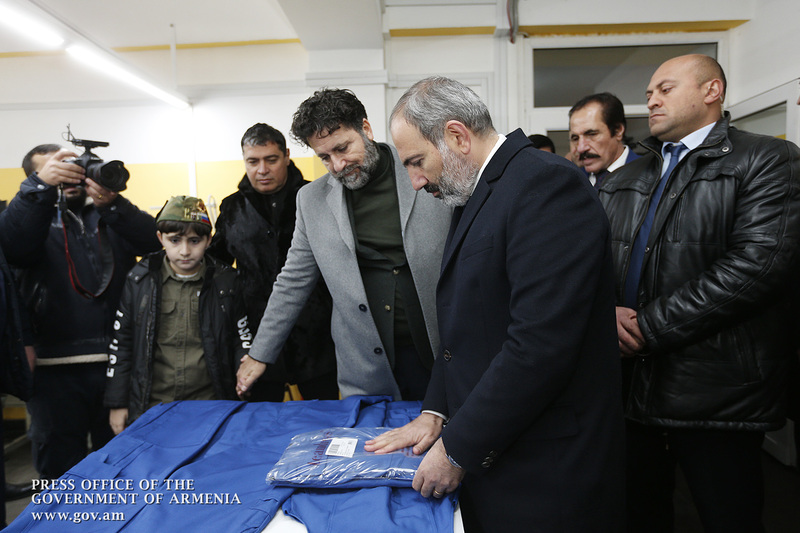 Before the government’s outgoing session, held in the Town Hall of Gyumri, Acting Prime Minister Nikol Pashinyan attended a postage stamp redemption ceremony dedicated to the Spitak Earthquake. 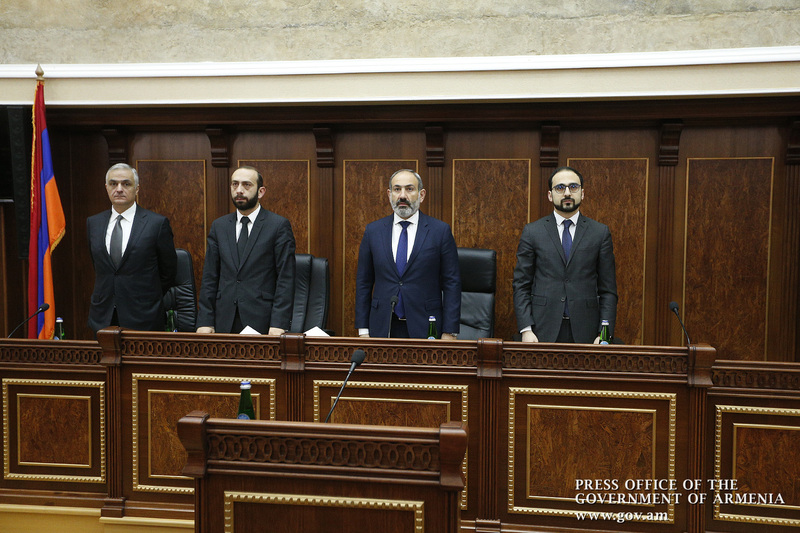 The stamp was cancelled by Acting Minister of Transport, Communication and Information Technologies Hakob Arshakyan, Acting Minister of Emergency Situations Felix Tsolakyan, Mayor of Gyumri Samvel Balasanyan and Haypost CJSC Board Chairman Juan Pablo Gechidjyan. 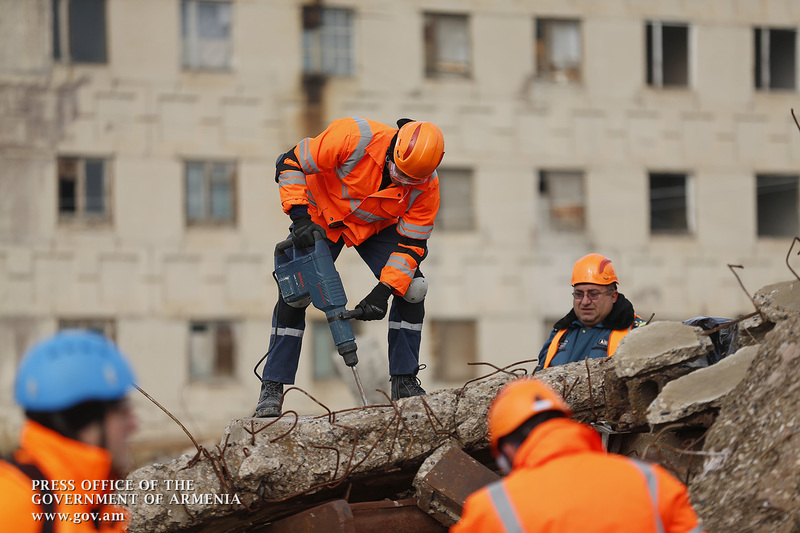 On a postage stamp scenes of the devastating earthquake of December 7, 1988 are presented in the form of a collage: collapsed buildings, rescue operations and clocks on the Freedom Square of Gyumri, which show the time when the tragedy occurred. The nominal value of the postage stamp is 230 drams. The postage stamp was printed in Cartor printing house (France) with a circulation of 30,000 copies. The author of the brand design is Chief Designer of “Haypost” CJSC Vahagn Mkrtchyan. 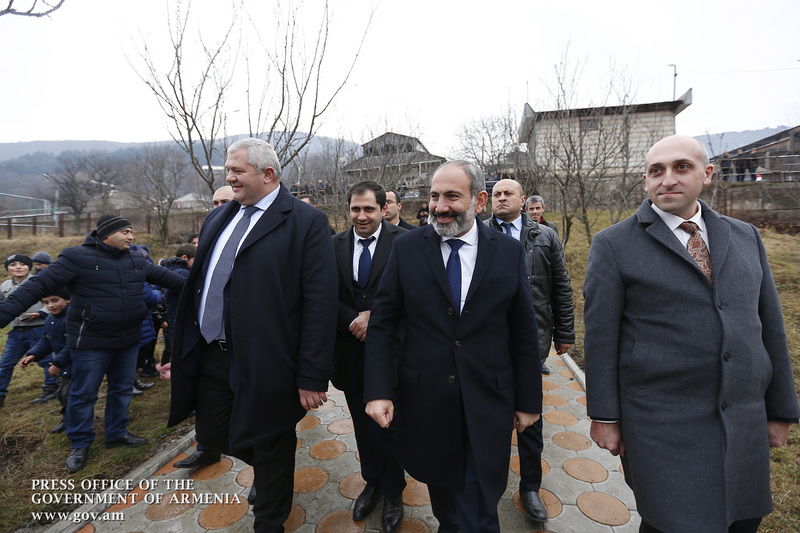 Chaired by Acting Prime Minister Nikol Pashinyan, the Government of Armenia today held an outgoing session at the Town Hall of Gyumri, dedicated to the 30th anniversary of the Spitak earthquake. 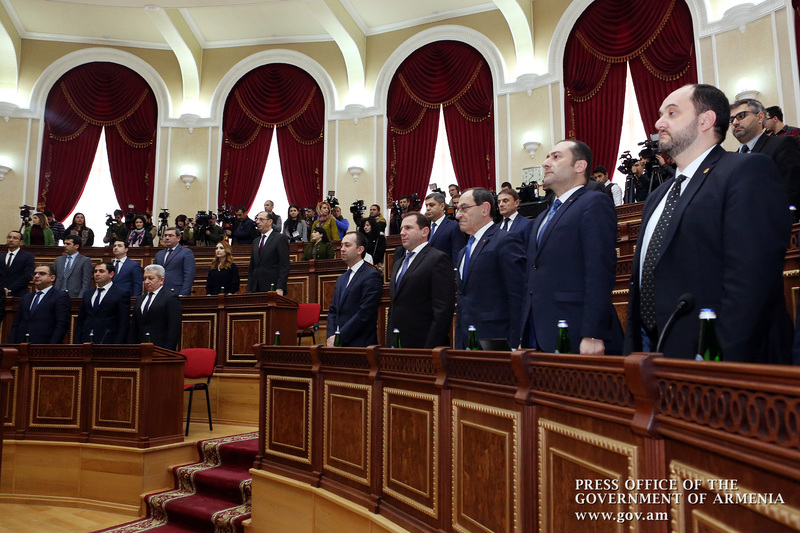 Before discussing the agenda items, those in attendance held a minute of silence in commemoration of the 1988 Spitak earthquake victims. Proceeding to the agenda, the Executive approved the Government’s legislative initiative on the draft law On Amending the RA Law on Holidays and Remembrance Days. 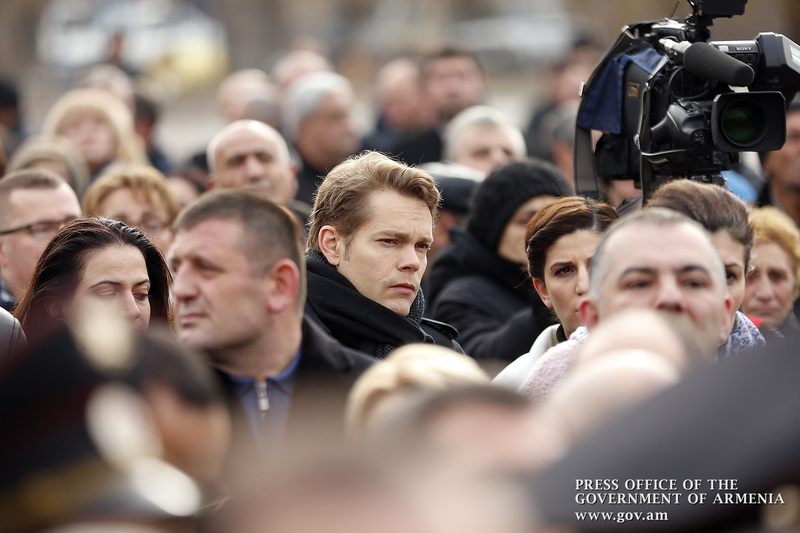 The bill provides that December 7 should be marked as Day of Remembrance and Disaster Resistance. 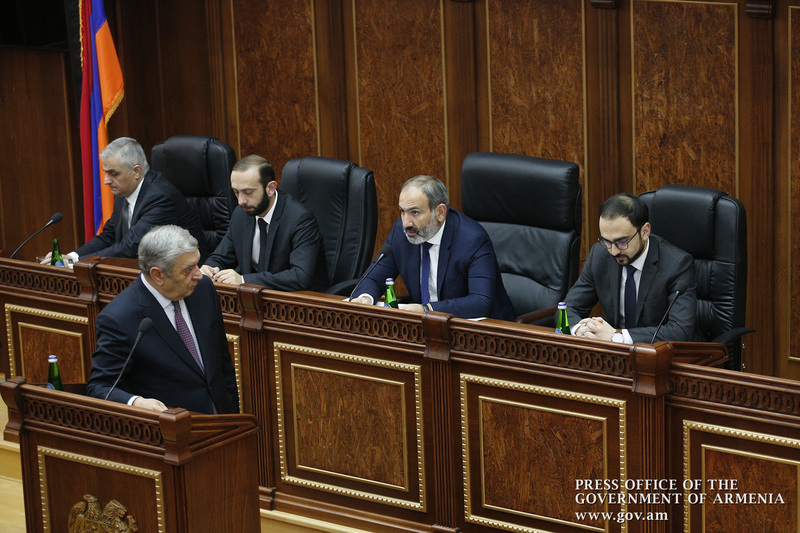 “By this decision, we state the need to increase the level of disaster prevention and protection in Armenia,” Nikol Pashinyan said, noting that for this purpose it is necessary to have a strategy and a clear program of activities. 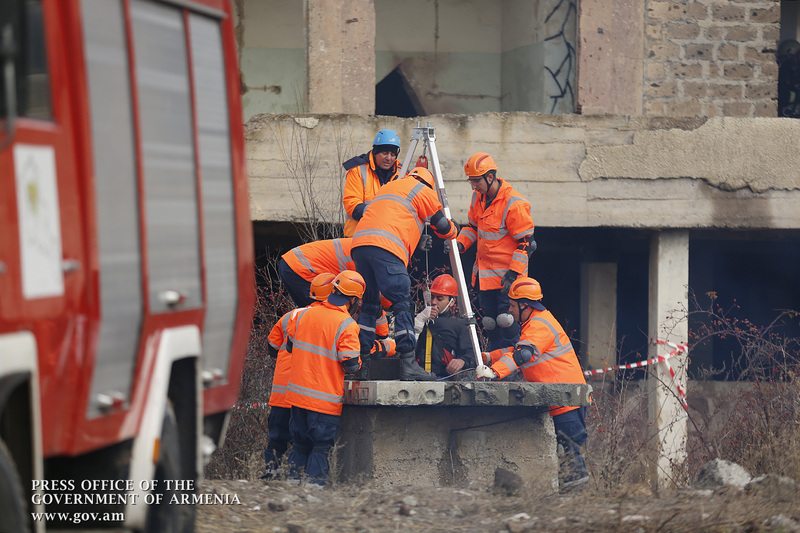 Acting Minister of Emergency Situations Felix Tsolakyan advised that many of those countries that had participated in rescue and reconstruction efforts in the disaster zone were prepared to mark the day in their countries as well. 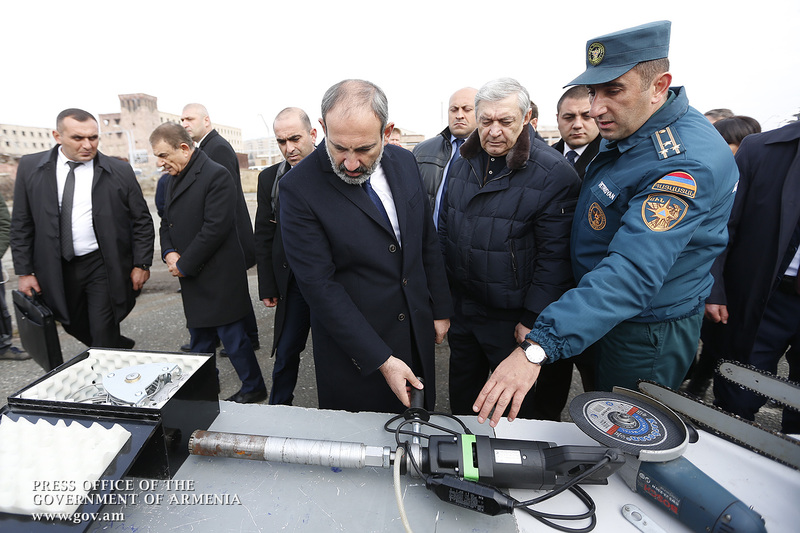 Acting Minister of Territorial Administration and Development Suren Papikyan reported back the activities carried out in the disaster zone in 2018 and the work to be done during 2019. 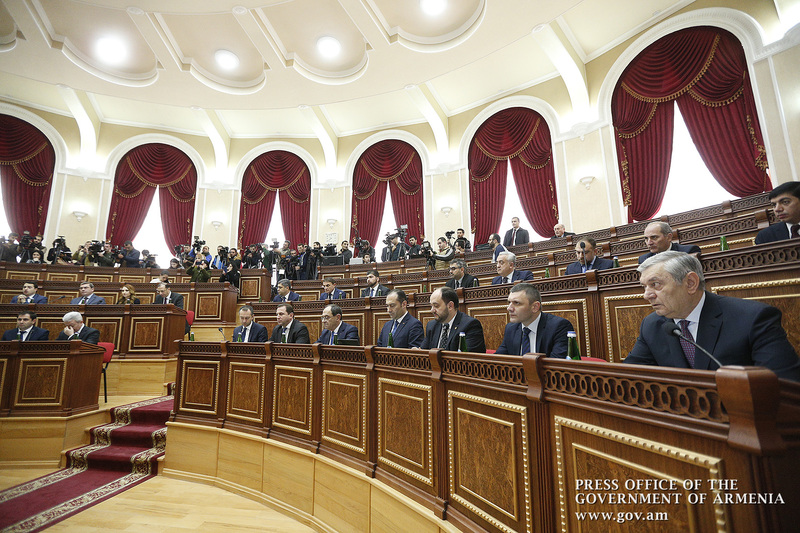 In 2018, 774,425.0 thousand drams have been allocated to Shirak and Lori Marzes within the framework of priority issues in the regions. AMD 354,915.0 thsd. AMD was allocated to Shirak Marz, 419,510.0 thousand - to Lori Marz. 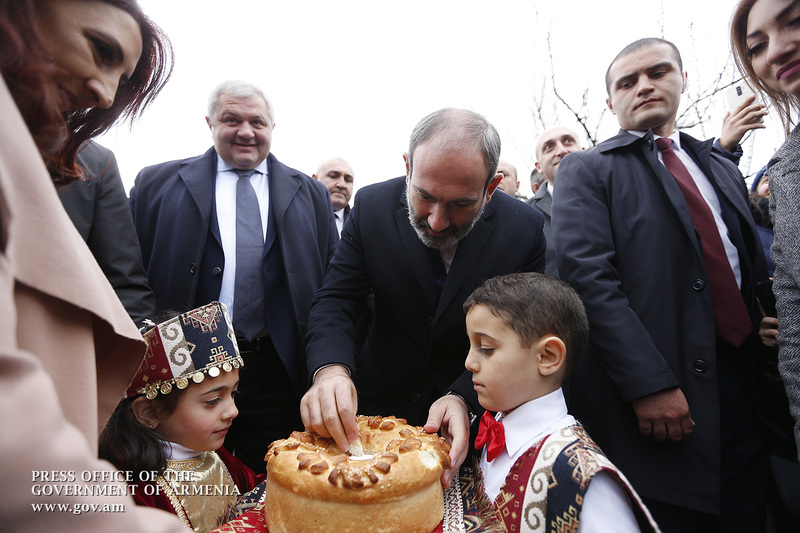 The amount was allocated for implementation of 54 projects in 45 settlements. 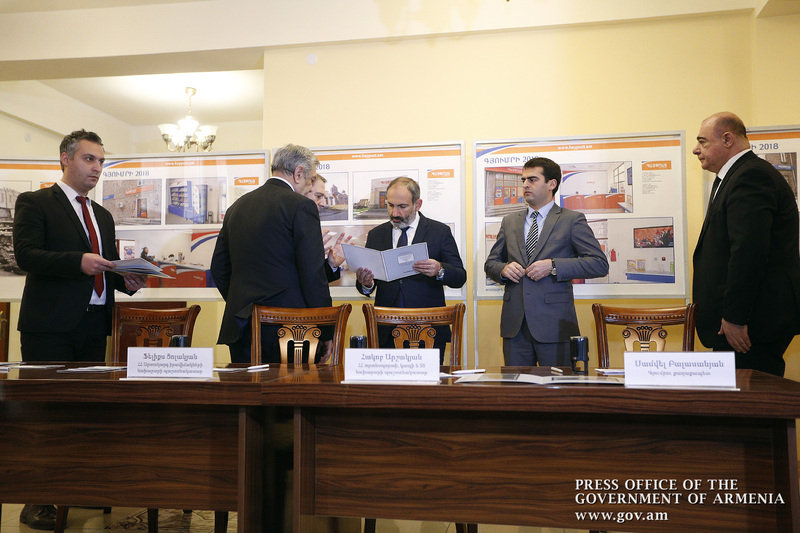 Within the framework of the same project, several communities in Shirak and Lori Marzes have been allocated 31,773.0 thousand and 11,200,000 thousand respectively. The Ministry of Transport, Communication and Information Technologies allocated 222,654.7 thousand drams for the repair of 4 roads in Shirak and Lori Marzes. Works will be continued in 2019. 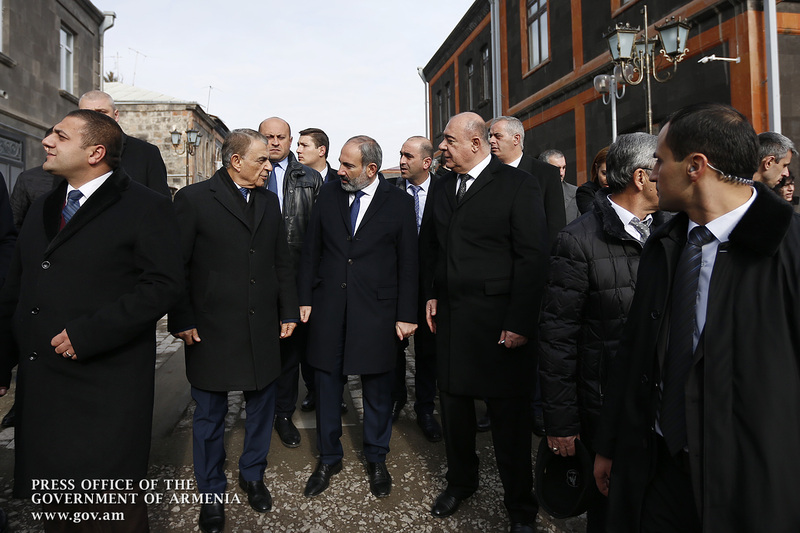 Through the Armenian Fund for Regional Development 7 projects are being implemented in these Marzes, of which 2 will be completed in 2019. The total cost of the programs is 1,939,574.1 thousand AMD. AMD 1,207,377.4 thsd. 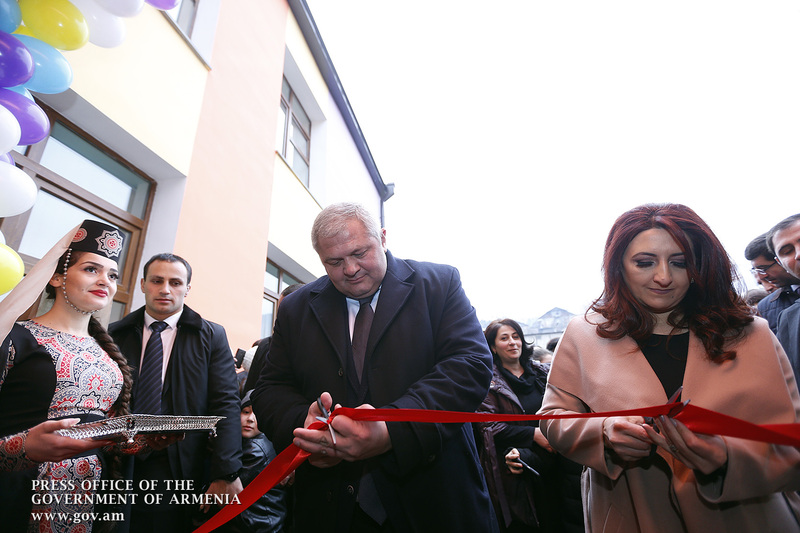 AMD was allocated to Shirak marz - AMD 732,196.7 thousand. AMD to Lori marz. 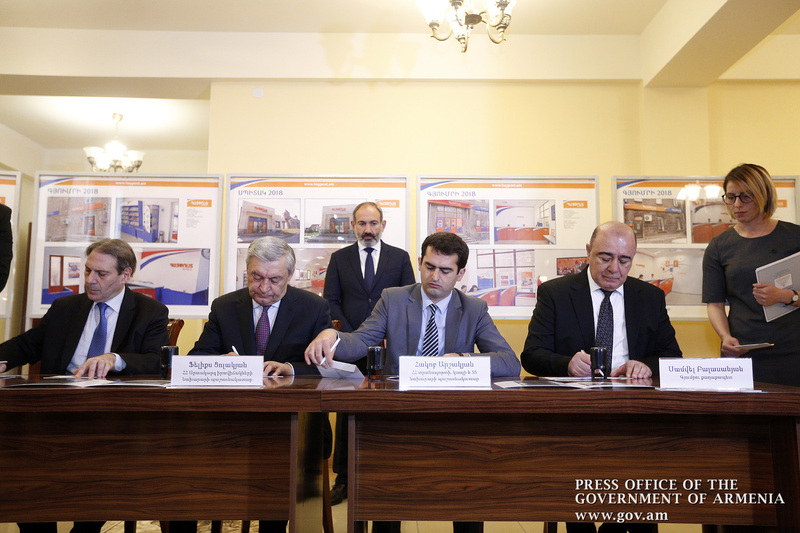 About 1,082,100.0 thousand drams have been allocated under the Gyumri Municipal Roads Technical Cooperation Grant Program, implemented with the support of the European Bank for Reconstruction and Development (EBRD). 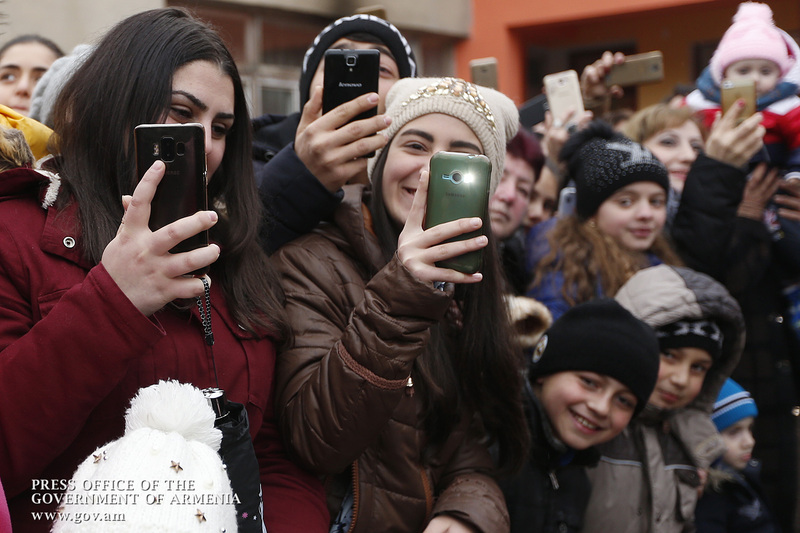 In cooperation with the EU, regional pilot projects are being implemented in Shirak and Lori Marzes. 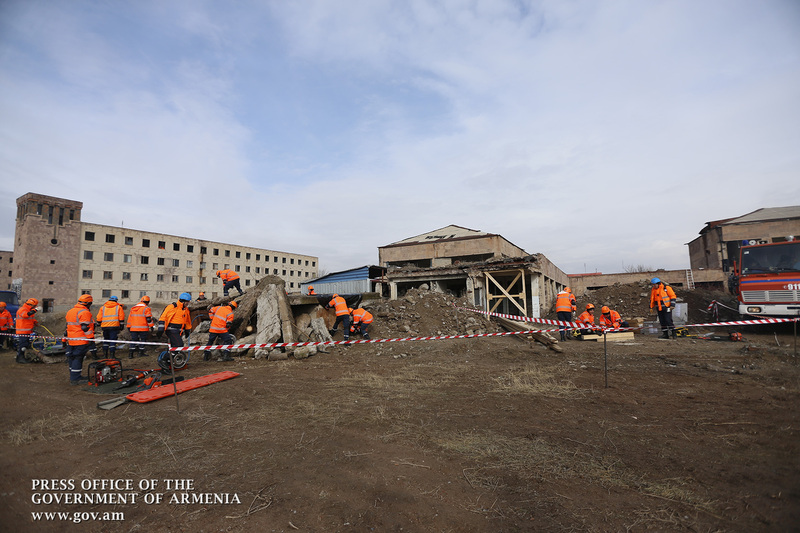 Head of Urban Development Committee Avetik Eloyan gave details of construction work implemented in the disaster zone during 2018 and to be carried out in 2019. 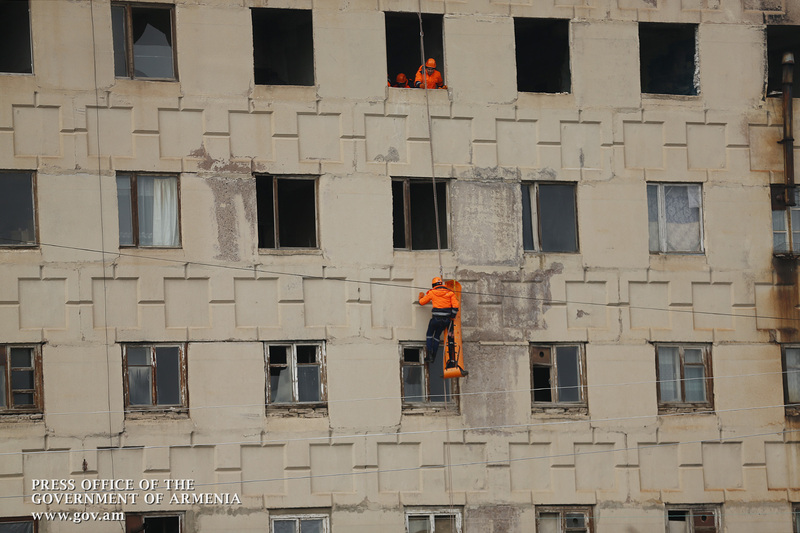 According to the report, 5381 families have been recognized as beneficiaries in Shirak, Lori and Aragatsotn Marzes within the framework of state-supported housing program to solve housing problems for families left homeless in disaster zones, of which 4839 housing problems were solved in 2008-2017, approximately 65 billion drams. The Government’s 2018-2022 Program provides that the State should have complied with the commitments assumed before the remaining 542 families by the end of 2020. 44 more households will be accommodated in the rural settlements of Lori Marz using the 460.0 million drams allocated from the State Budget in 2018. As a result, 498 families will still be facing housing problems that call for about 3.5 billion drams. 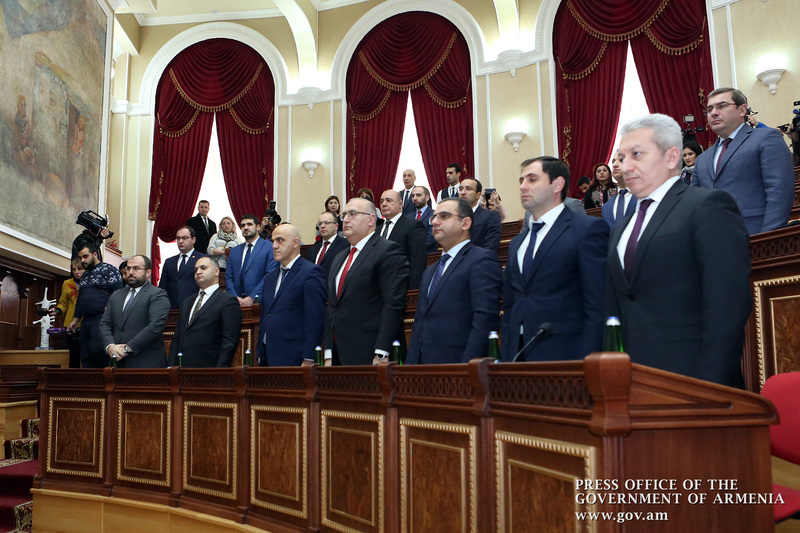 At the same time, AMD 560.0 million has been envisaged in the State Budget in 2019. 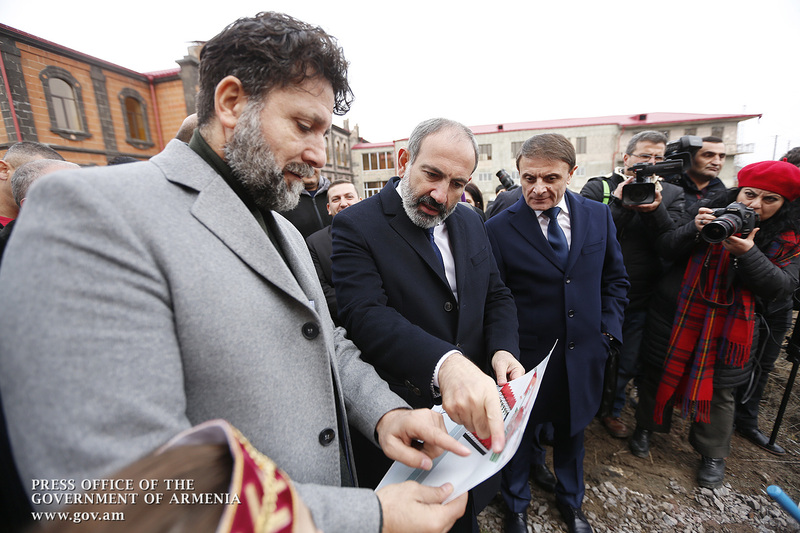 In addition, the respective community leaders should carry out the documentation of all non-basic buildings, as a result of which the graphic and tabular materials should be drawn up, with the relevant information to be submitted to the Urban Development Committee and the Ministry of Territorial Administration and Development by the end of the year. Based on the certification results, recommendations should be drawn to release territories from non-basic constructions and legalize buildings conforming to town-planning requirements by the end of next June. 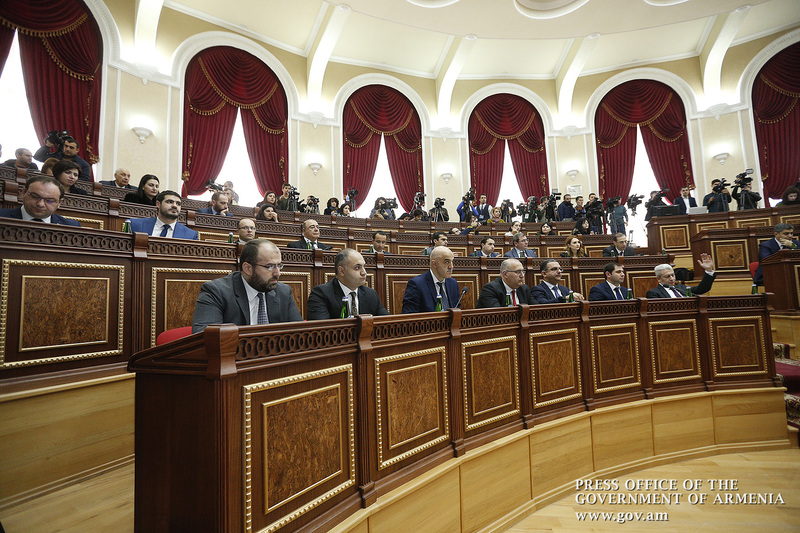 About AMD 460.1 million was allocated from the State Budget to complete the construction and reconstruction of educational, cultural and sports facilities in 2018. The outgoing Cabinet sitting next discussed the problems of homeless people in the disaster zone. 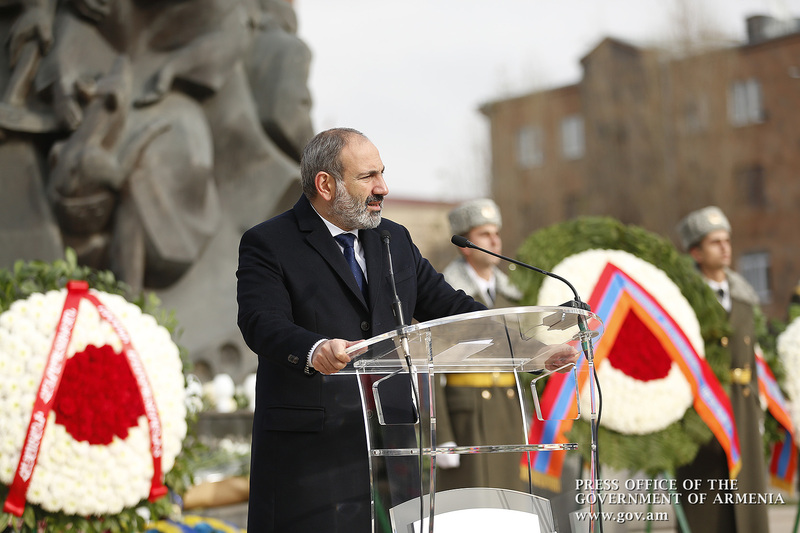 Head of Urban Development Committee Avetik Eloyan noted that the government has an outstanding commitment before 498 families. According to him, there may be inaccuracies in the presented figures, so it is necessary to carry out research and documentary work to find out the actual number of families in need of housing. 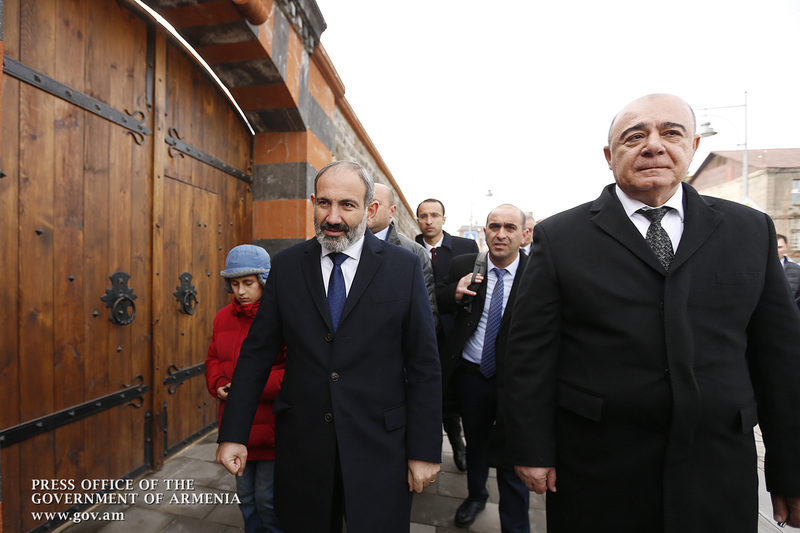 Mayor of Gyumri Samvel Balasanyan reported that the number of temporary shelters registered in Armenia is 2856, 456 of which are not inhabited. “Besides, there are 1014 registered users who have not been registered because they did not submit the required documents. 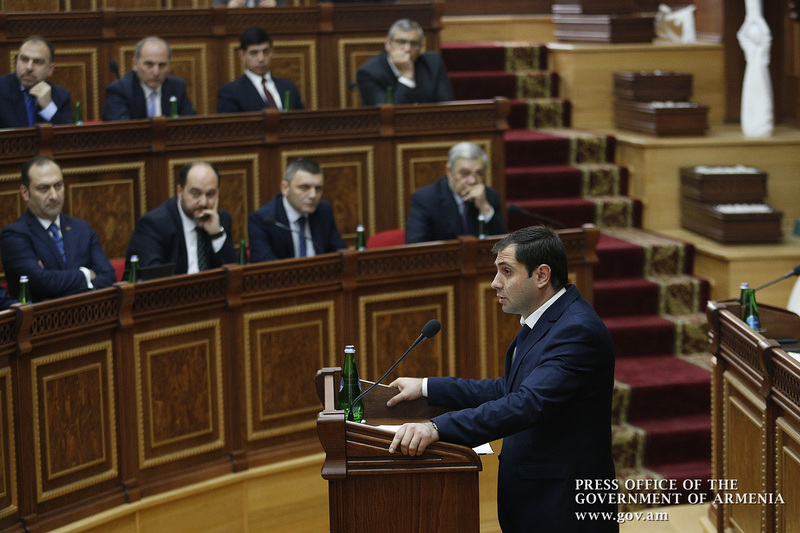 There were many families whose families had moved to a new apartment, some of them stayed in the cabin, there were people who immigrated to Gyumri, bought a cottage, got registered and lived, there are families renting those cottages,” Samvel Balasanyan said. The Acting Head of Government instructed to set up a task force to deal with registration issues and report back the actual state of affairs in the disaster zones. The Task Force shall report to the Prime Minister on the work done every two months. “We keep talking about the disaster zone, housing problems, but we do not know what we are talking about. 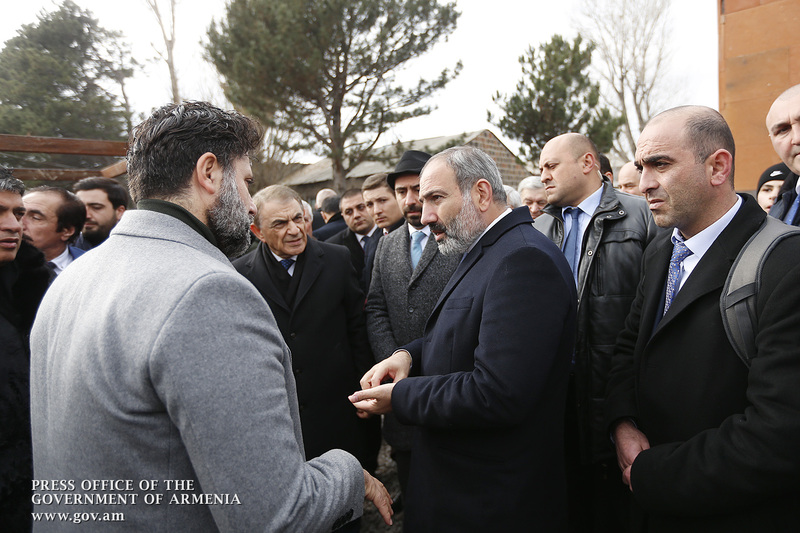 Therefore, you should form a task force with a clear-cut objective: to draw up a disaster zone package with accurate figures and a definite roadmap so that we could understand what needs to be done, how much money and time is needed to tackle the problem in the context of the ongoing processes,” Nikol Pashinyan emphasized. 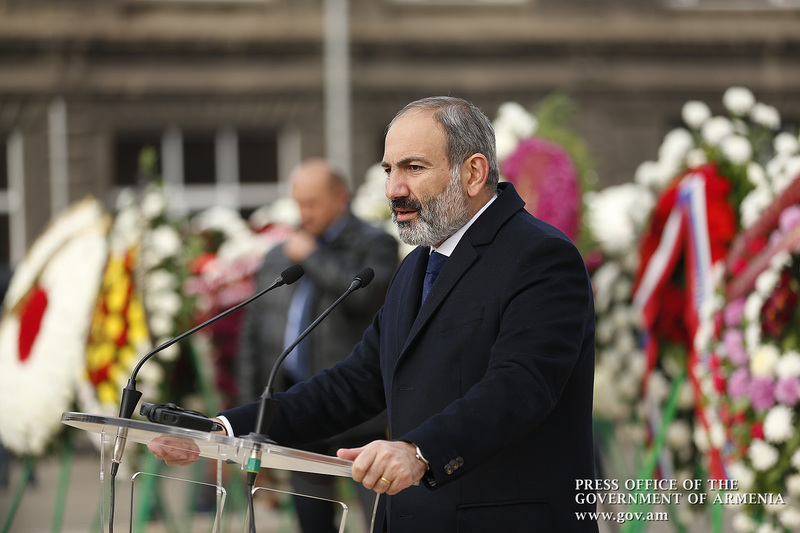 As part of commemorative events dedicated to the 1988 Earthquake’s 30th anniversary, Acting Prime Minister Nikol Pashinyan today paid tribute to the victims of the earthquake in Gyumri. 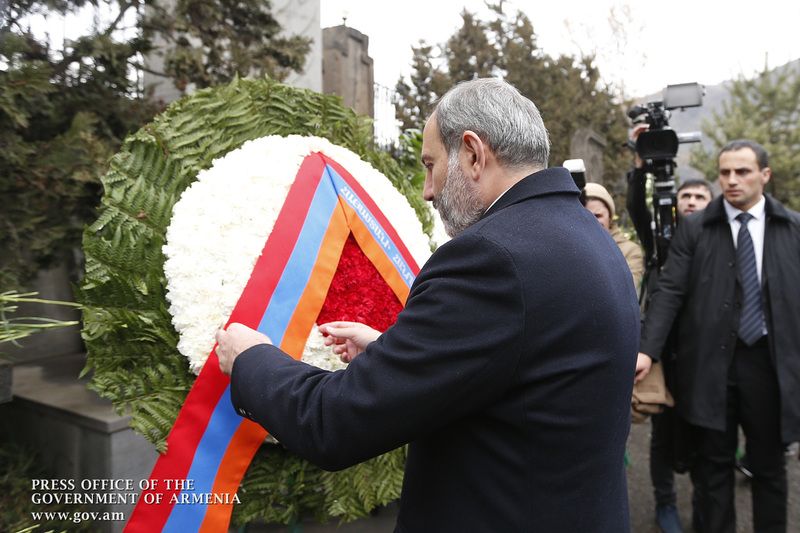 At 11:41 pm, Nikol Pashinyan laid a wreath at the monument in the St. Amenaprkich Church. 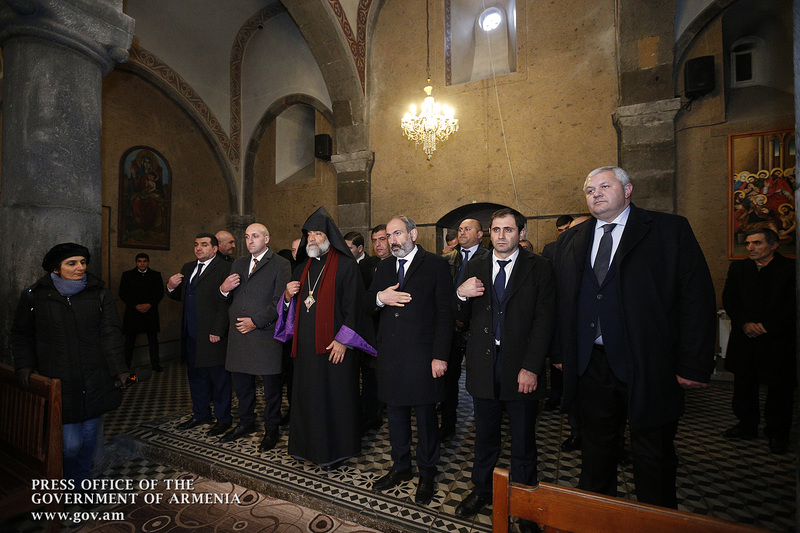 Nikol Pashinyan attended a requiem service to the victims’ memory. This day 30 years ago, the devastating Spitak earthquake hit the region, the epicenter of which was a short way from Nalband village, now Shirakamut. The earthquake registered a magnitude of 9 to 11. Over 25,000 civilians were killed, with about 500,000 people left homeless, while hundreds of thousands of buildings were ruined. Such a high death toll was a direct blow to our people’s potential. The disaster was a direct blow to our country’s economy and a huge psychological and moral blow to the nation. 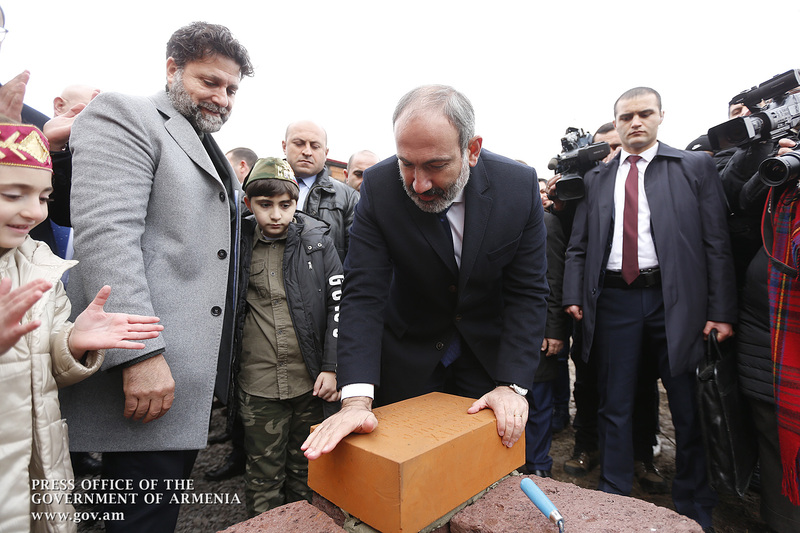 At the same time, the disaster became a unique cornerstone for national consolidation, and hundreds of thousands of millions of people around the world took their attention to their historic homeland. 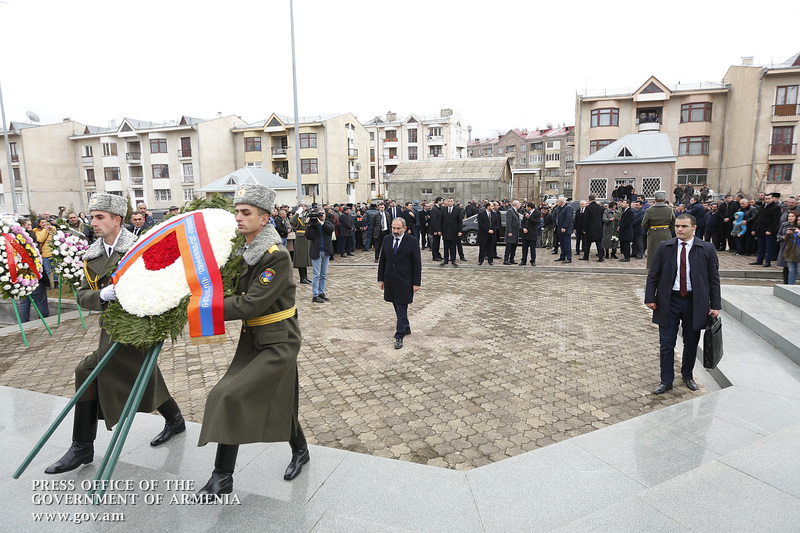 Perhaps the most striking example is the example of French-Armenian singer Charles Aznavour, who immediately responded to the earthquake, visited the disaster zone, grew twice, many times as closely attached to his homeland, which continued until the end of his life. The earthquake also caused a unique consolidation around humanitarian values across the globe. 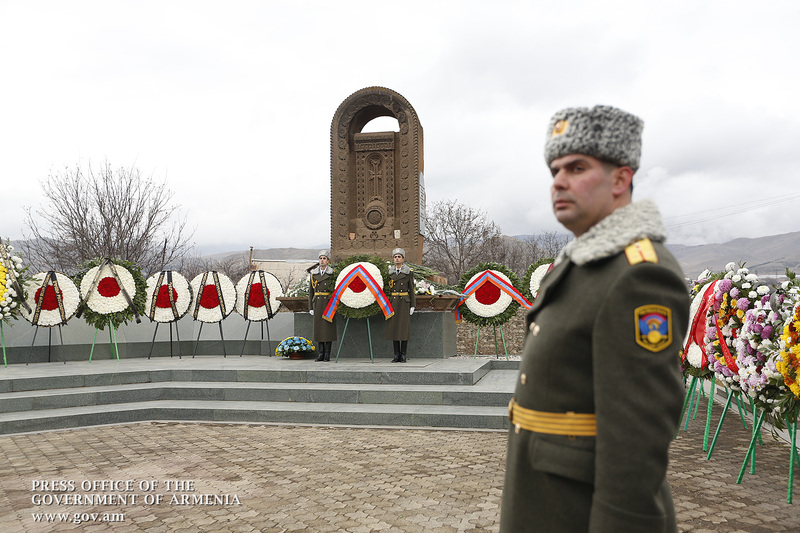 The friendly peoples of the Soviet Union, the friendly peoples worldwide made their contribution to our people and Armenia, showing thereby a unique example of universal unity. Nevertheless, the problem of disaster zone remains topical 30 years after the earthquake. Of course, by saying disaster zone we first of all understand the housing needs of people, construction and the opening of schools and kindergartens. 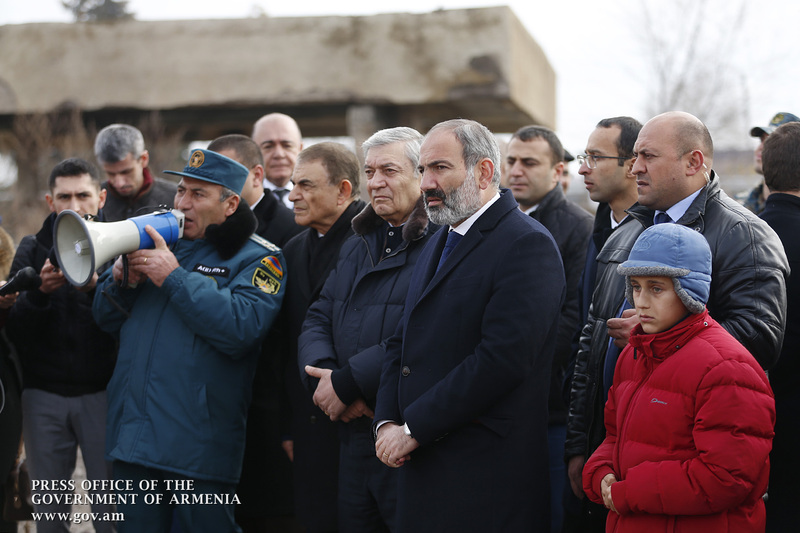 Nevertheless, it should be noted that the earthquake destroyed a huge economic segment of pivotal significance for Armenia’s industry, and by saying disaster zone rehabilitation we should mean not only the restoration of people’s housing needs, but also the construction or restoration of schools and kindergartens, the reinstatement of our country’s economic potential in Gyumri, Vanadzor, Spitak, Akhuryan and throughout the disaster zone, as a whole. But the biggest damage caused by the disaster was the devastation that occurred in the souls of people. Shortly after the earthquake, the disaster zone rehabilitation started, which was not the case with the people’s hopes, self-confidence and optimism. Therefore, we first of all need to have it in mind when we speak about the disaster zone. When we say disaster zone, first of all we have to consider how much we have managed to restore people’s confidence in their own strengths, how much we have restored their optimism about the coming day, how much we have strengthened the belief that the victims’ incomplete deeds and dreams will come true one day. This approach to rehabilitation is what matters most for me. 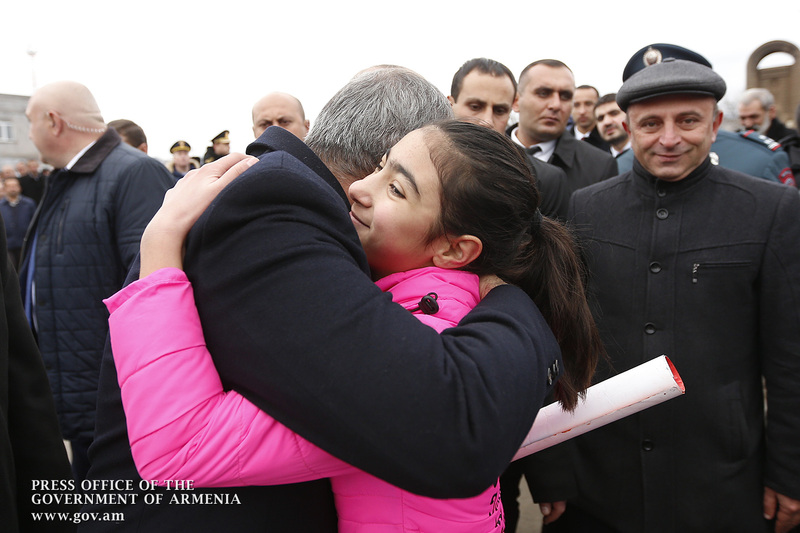 I do hope and I am convinced that the processes underway in Armenia are meant to restore people’s hopes and optimism. 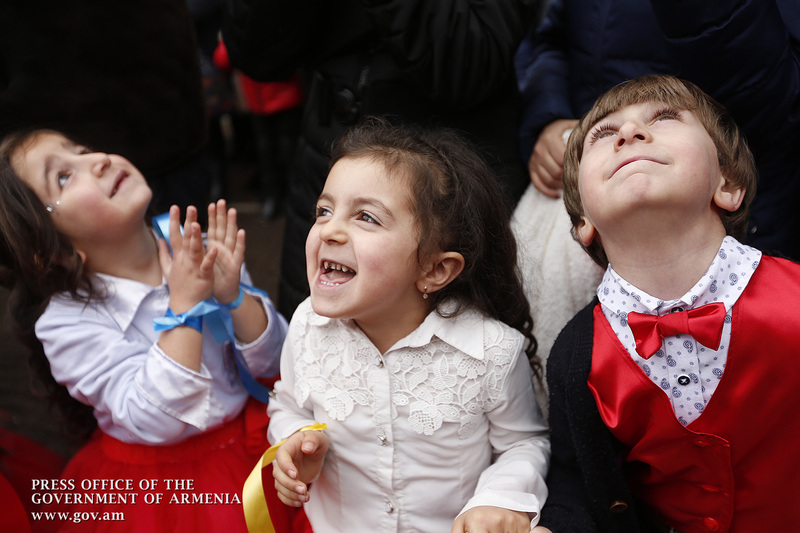 And I am convinced that yes, we have entered a stage where every day, every hour, every month, every week we must seriously rebuild the people’s faith and confidence in their own future, the future of their own country, and the future of their children. 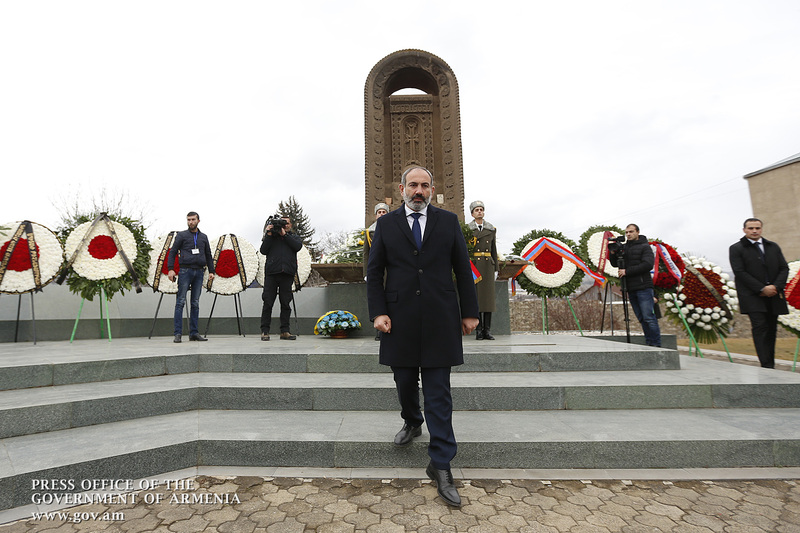 And this is the most important mission of today’s government and the future governments, just because unfortunately Armenia turned into a big disaster zone after the earthquake, and our greatest challenge is to overcome this psychological catastrophe and civil tragedy. 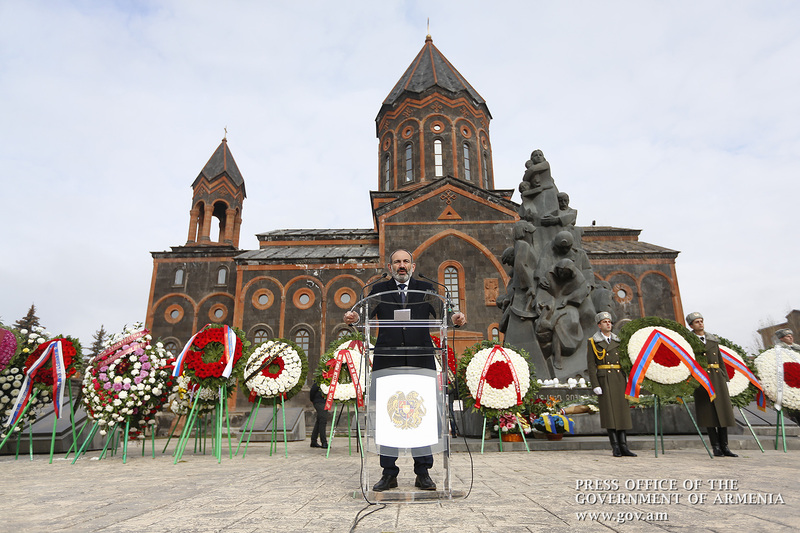 And now, on this holy day, and from this sacred site, I would like to address all the citizens of the Republic of Armenia, and especially those who suffered from the devastating earthquake of December 7, 1988: Dear compatriots, your pain is in my heart, your needs are in my mind, your dreams are in my soul and inspire confidence that everything will be fine, everything will actually be good. 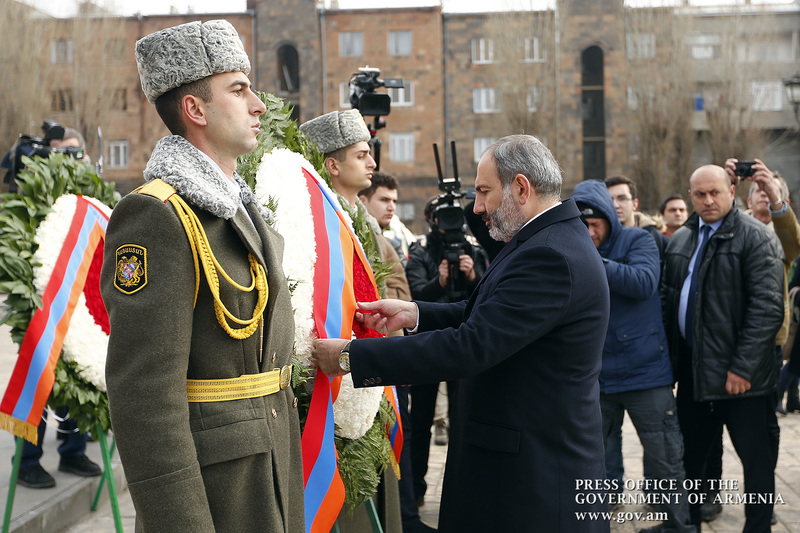 And therefore, long live the heroic people of Gyumri, long live the heroic people of Vanadzor, long live the Armenians of Spitak and, in general, the Armenian people, who have been waging a millennia-long struggle against death, and have won a victory for the sake of life and creativity. 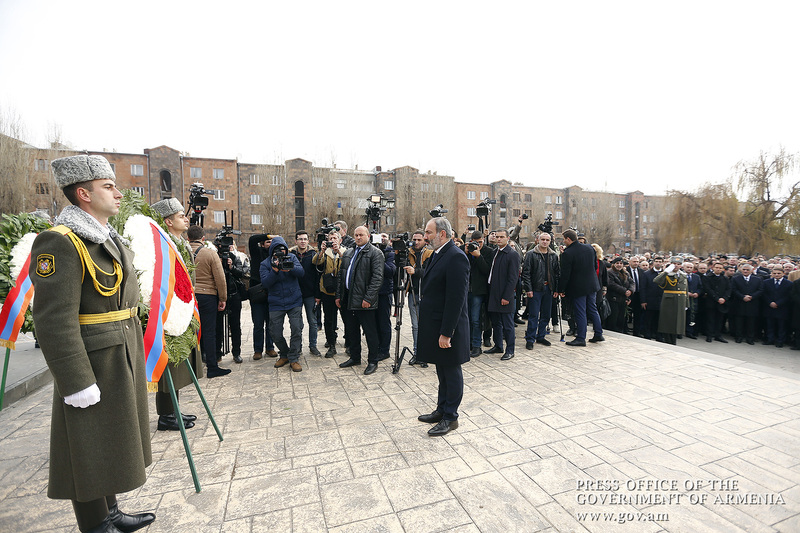 The event was attended by the RA National Assembly President, government members, the Mayor of Yerevan, other high ranking officials, representatives of the diplomatic corps accredited in Armenia, Deputy Minister of Emergency Situations of the Russian Federation Nikolay Grechushkin, and Governor of the State of Kansas Jeff Colyer. 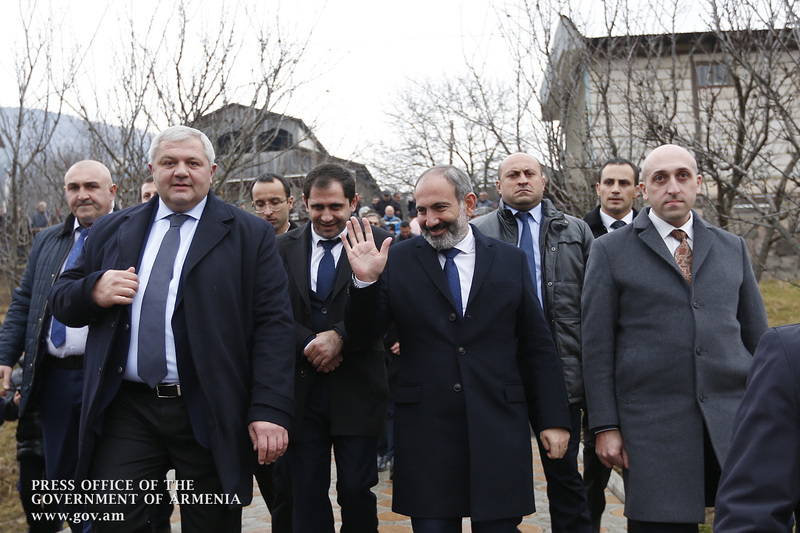 As part of events dedicated to Spitak Earthquake’s 30th anniversary, Acting Prime Minister Nikol Pashinyan toured Gyumri’s old quarter, including Jivani, Rustaveli, Nikolay Ghorghanian and Varpetats streets. 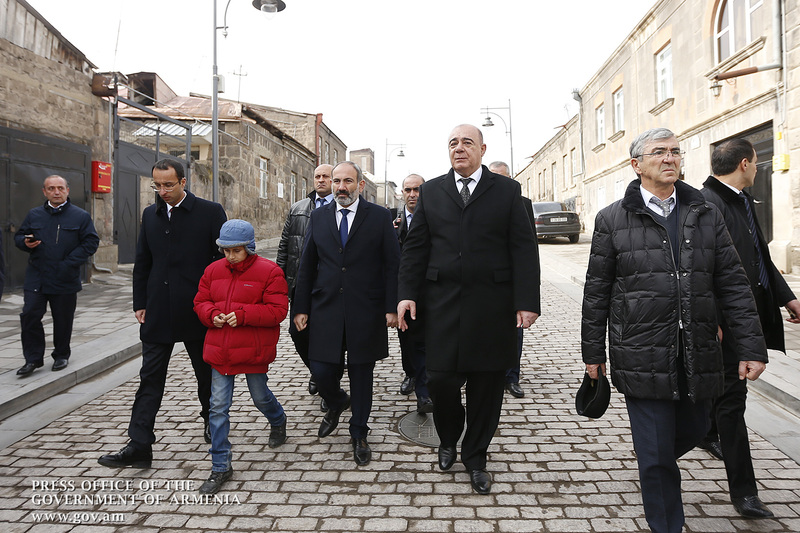 The Acting Head of Government got acquainted with the ongoing rehabilitation work in Gyumri’s historical center. 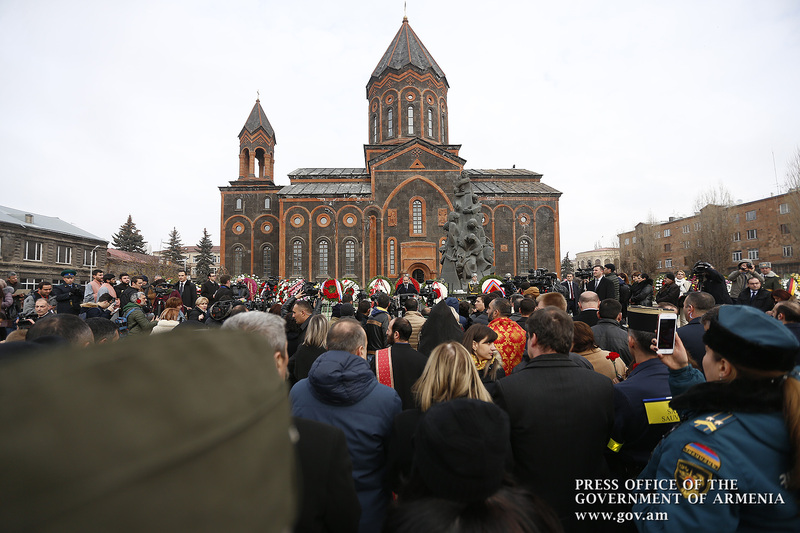 Gyumri Mayor Samvel Balasanyan advised that the construction is scheduled completion in the second half of 2019. 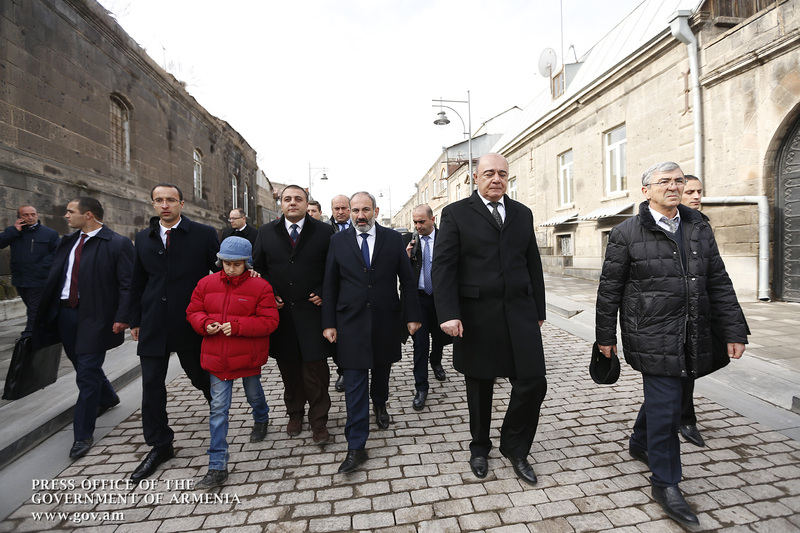 About 40km-long road sections will be rehabilitated with a €23 million loan provided by the World Bank and EBRD. The 12 km work has already been completed. Zoning will be implemented in the historical center. 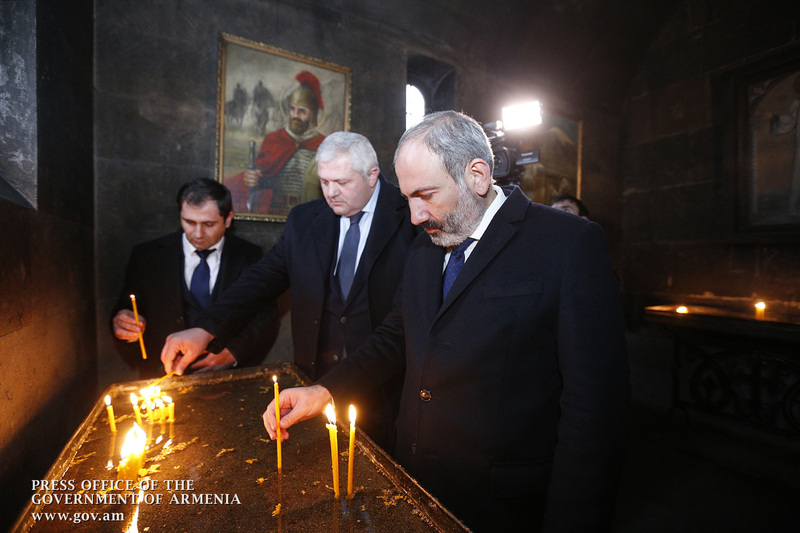 Nikol Pashinyan attached importance to the effective implementation of the programs and expressed conviction that they will contribute to the development of the city, increase the number of tourists. 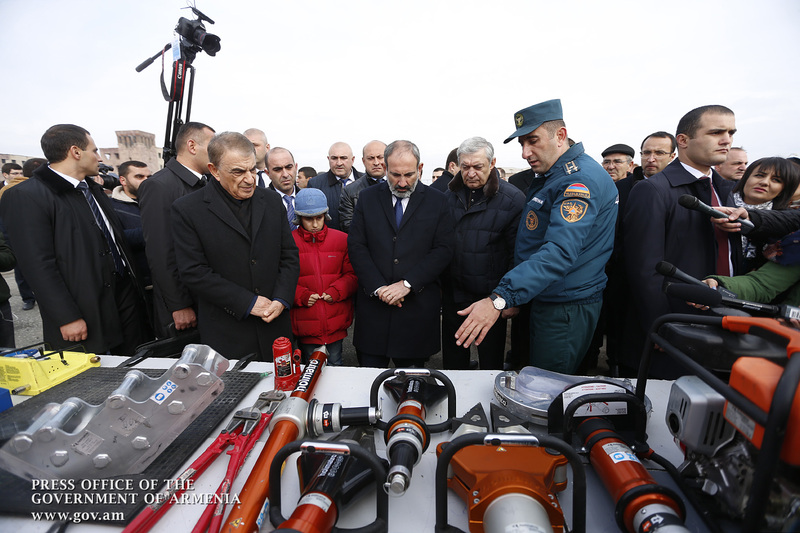 Then, the Acting Prime Minister watched an exercise organized by the Ministry of Emergency Situations with a conventional scenario that the rescuers drove the residents out of the ruins of the earthquake and managed to reach the first medical aid facility. 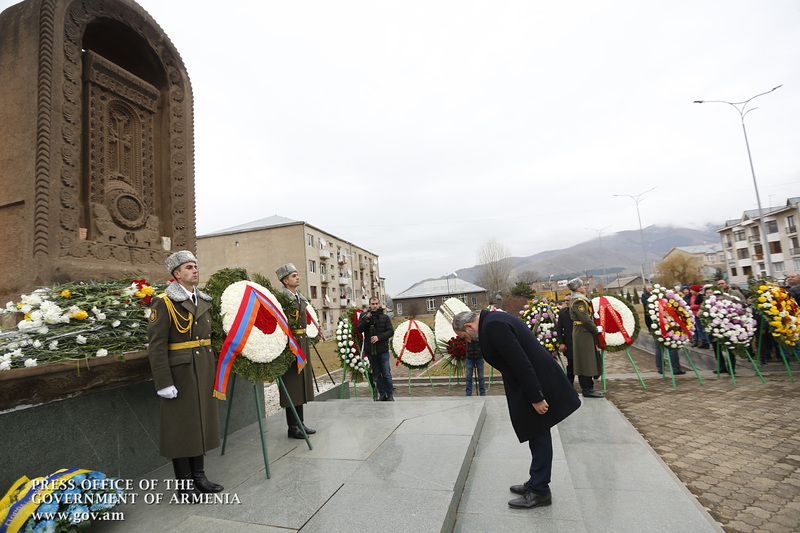 The Acting Head of Government laid flowers at the monument to Charles Aznavour in Gyumri and paid tribute to his memory. 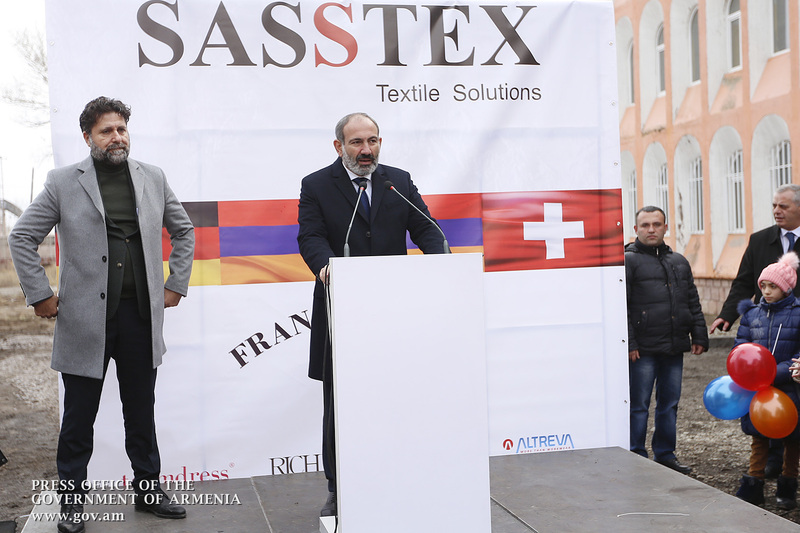 Nikol Pashinyan next called at Sastex clothing factory in Gyumri to get acquainted with the ongoing investment project, which will help provide 350-370 light industry jobs in Gyumri. 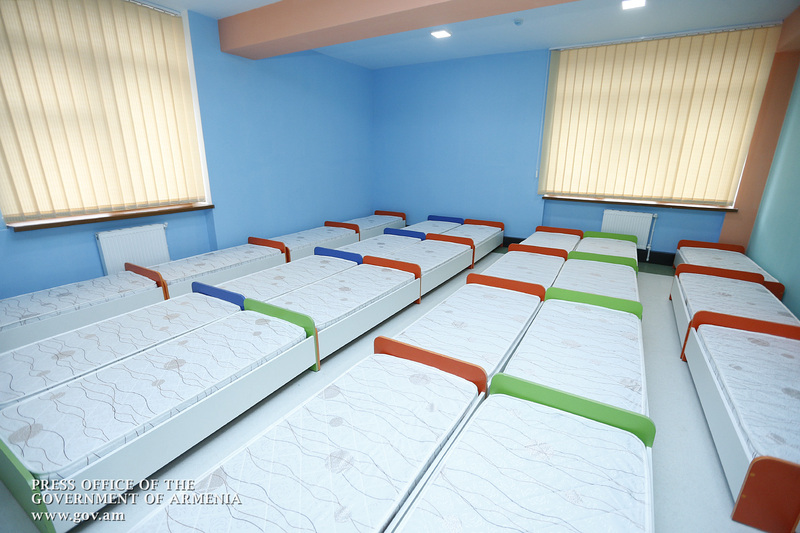 150 people are involved in the only one month-old facility. The entire lot of working clothes will be exported to European countries. 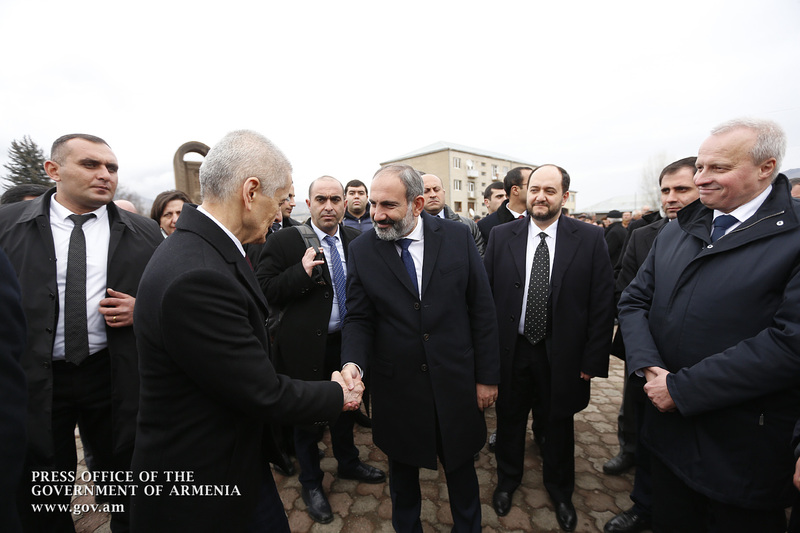 The Acting Prime Minister also participated in a ground-breaking ceremony. 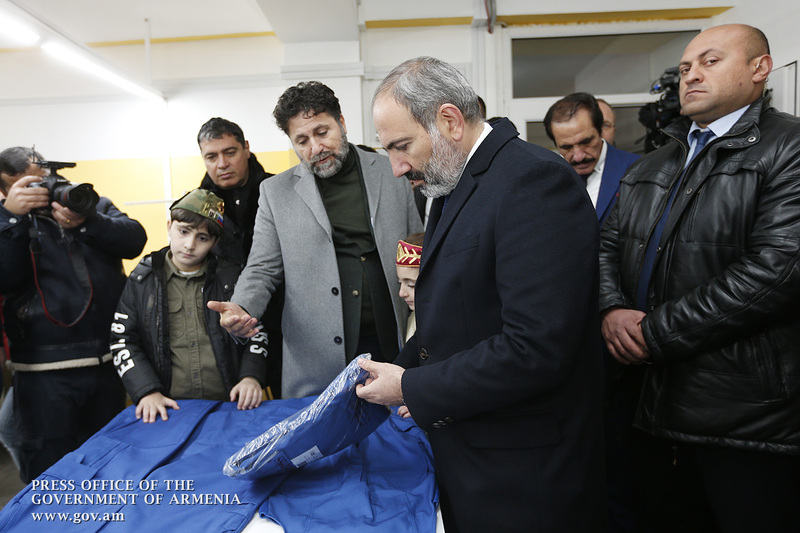 The executives noted that they are going to set up a garment factory in Spitak, and another such facility in Artik. 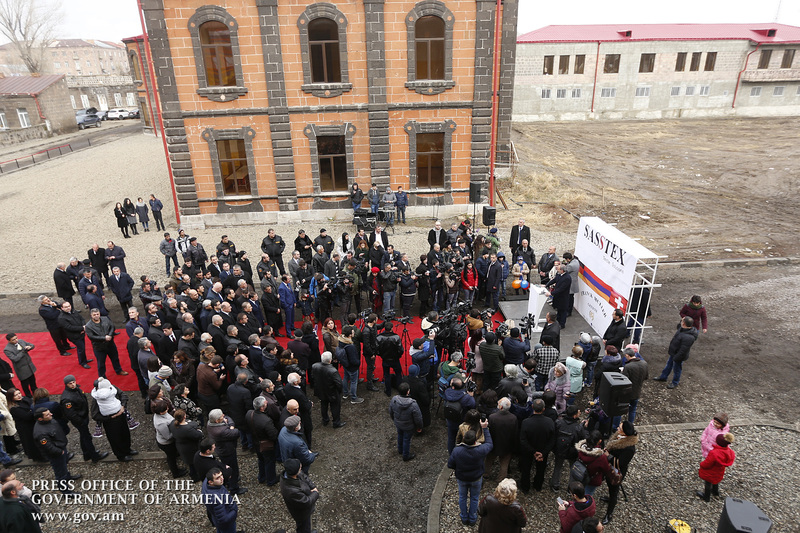 The Acting Head of Government said he had attended the commissioning of two factories last week and was glad to see them initiated by Diaspora-based Armenians. “This process corresponds to 100% of our perceptions of economic revolution. People do their part and ask the government to offer more favorable conditions for investments. 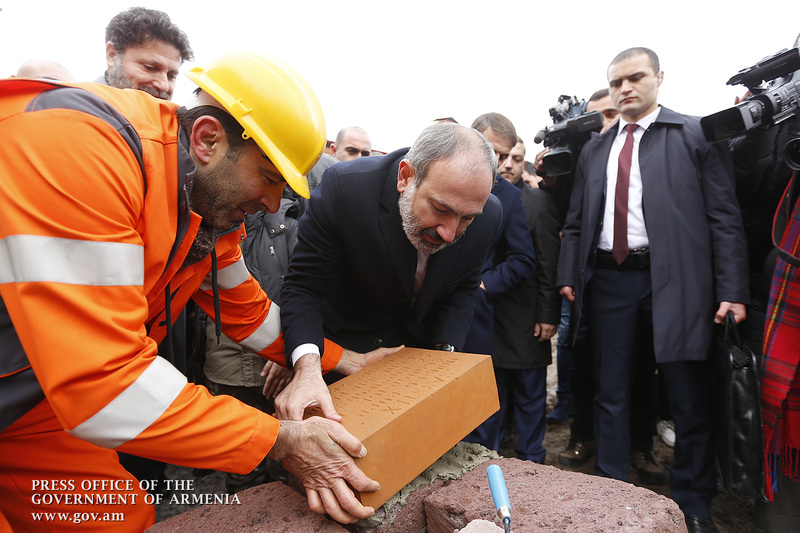 I am convinced that such investment projects will contribute to our country’s economic development and are the most important steps towards building a prosperous country,” Nikol Pashinyan said, thanking all those investors who have been creating new jobs during the 27 years of independence. 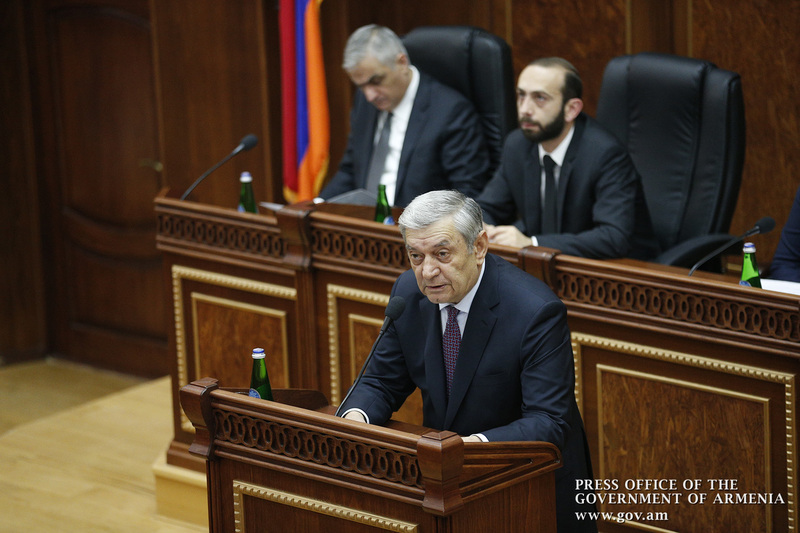 “The status of a businessman is supposed to be unique and should be seriously reconsidered in Armenia. We must solve all the problems facing our country by getting richer and enriching others. 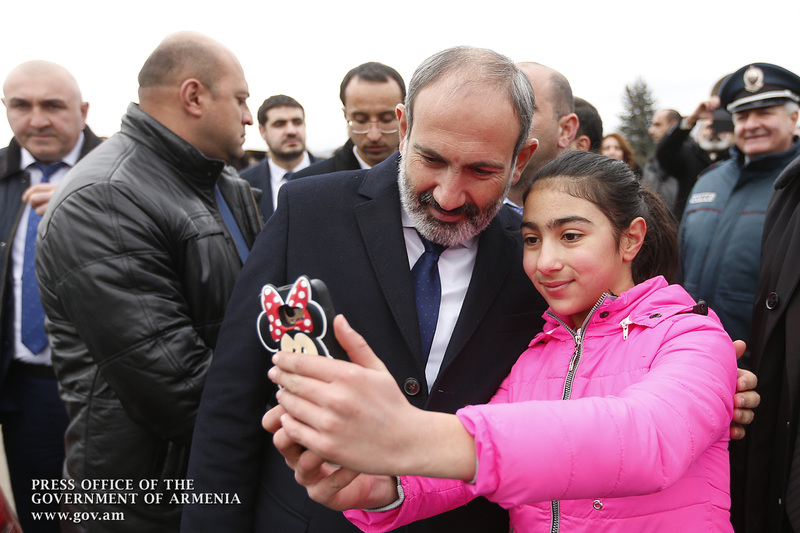 Thank you for responding to our call,” Nikol Pashinyan said. 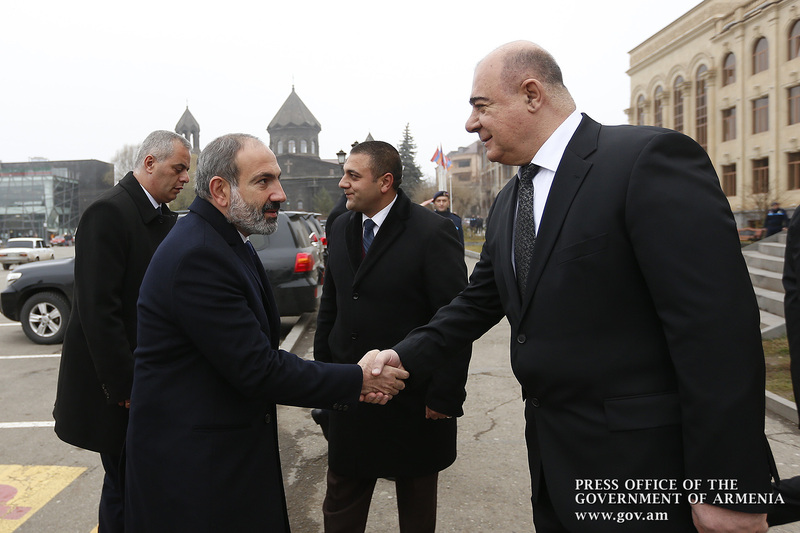 Then the Acting Prime Minister left Gyumri for Lori Marz. 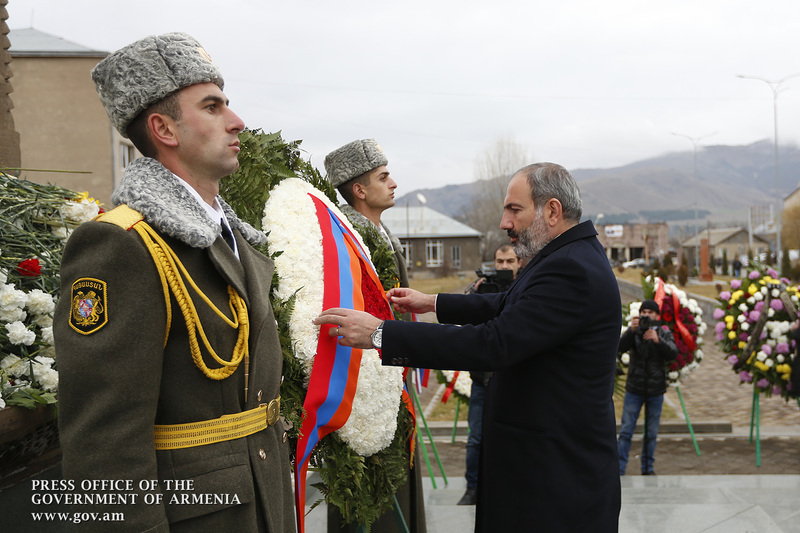 Nikol Pashinyan laid a wreath at the memorial to Earthquake’s victims and lit candles in Spitak’s Harutyun Church. 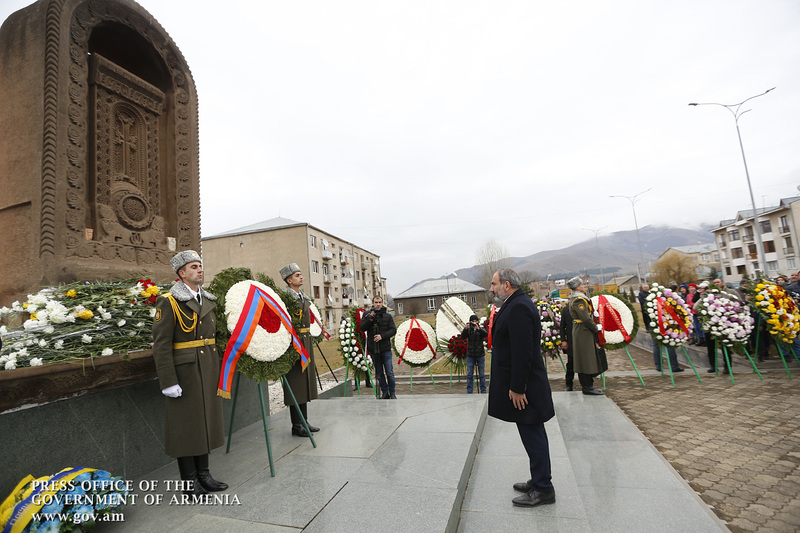 The Acting Head of Government also laid a wreath at the khachkar (cross-stone) dedicated to the victims of the earthquake in Vanadzor, after which he attended a kindergarten opening ceremony. 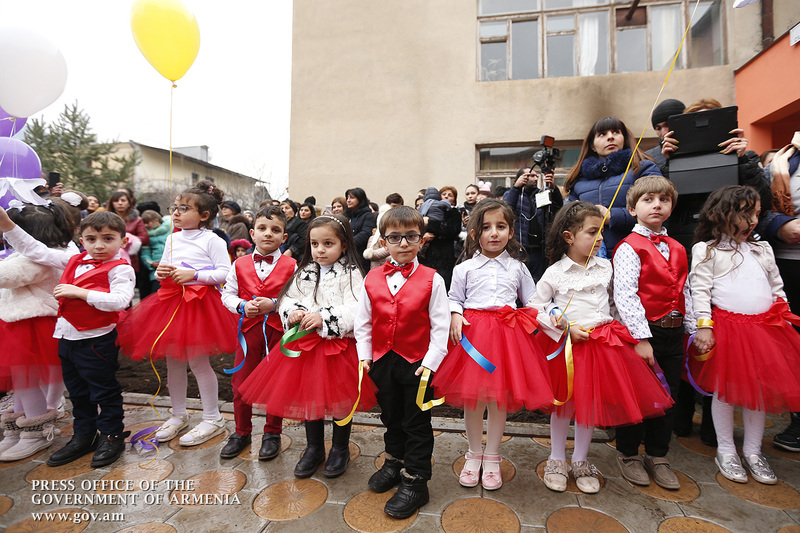 The kindergarten was renovated under a project implemented by the Armenian Territorial Development Fund for which AMD 150 million has been spent. 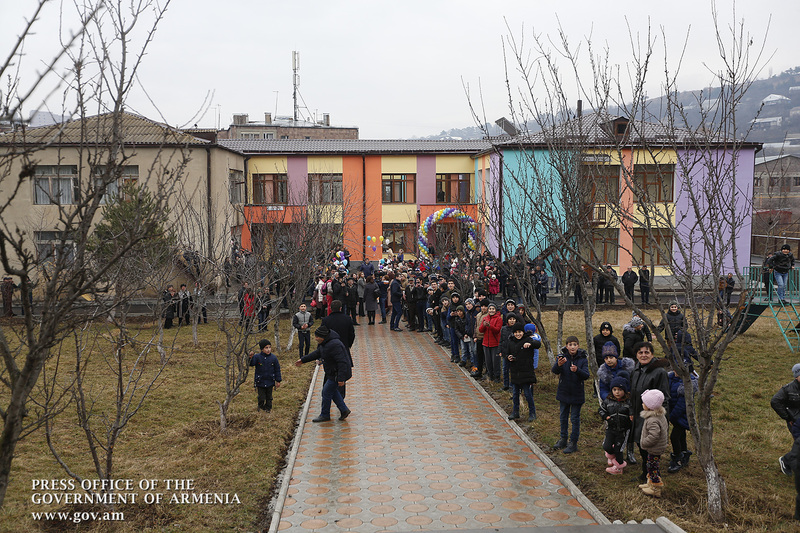 The kindergarten has been furnished with modern furniture and infrastructure, and the yard has been repaired. 100 children will attend the kindergarten. 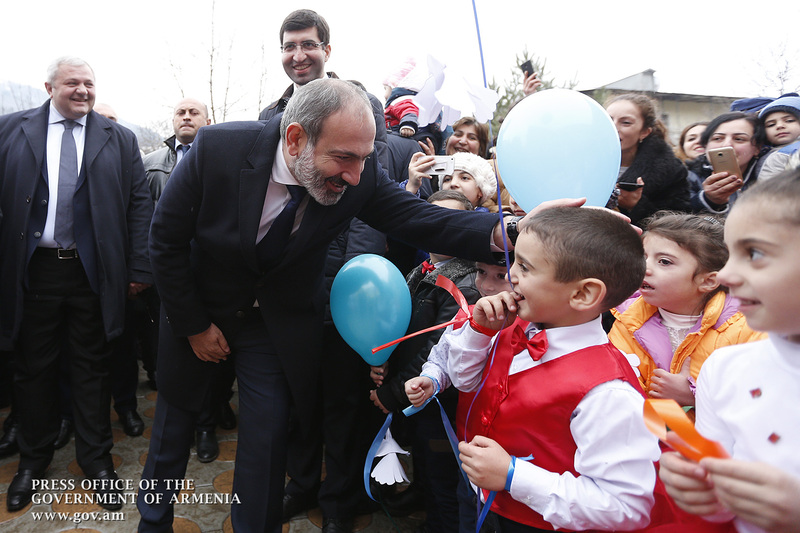 Nikol Pashinyan toured the renovated kindergarten and got acquainted with the work done.